To receive an Excellent rating, a faculty member should demonstrate evidence of instructional vitality, e.g. developing new courses, methods and materials; innovations in course content or methodology; and use of a variety of teaching methods. I have expressed vitality in many ways since joining ISAT, including using new and innovative approaches to teaching, developing and delivering entirely new courses, using new methods and materials in courses, leading innovations in course content, and using a variety of teaching methods. Each of these is described in detail below. New and Innovative Approaches to Teaching (GISAT 251/Statistics through Storytelling): In Spring 2014 was inspired by Malone et al. (2010) to reconsider the sequencing of topics in our foundational statistics class. Each alternative model that they considered had a unifying theme: instead of covering topics in order following the textbook, they started with the most essential ingredients (variables and basic graphs and plots) and then modeled the behavior of a data analyst exploring multiple cases, each of which implements the same basic steps but different charts, graphs, and tests of inference. 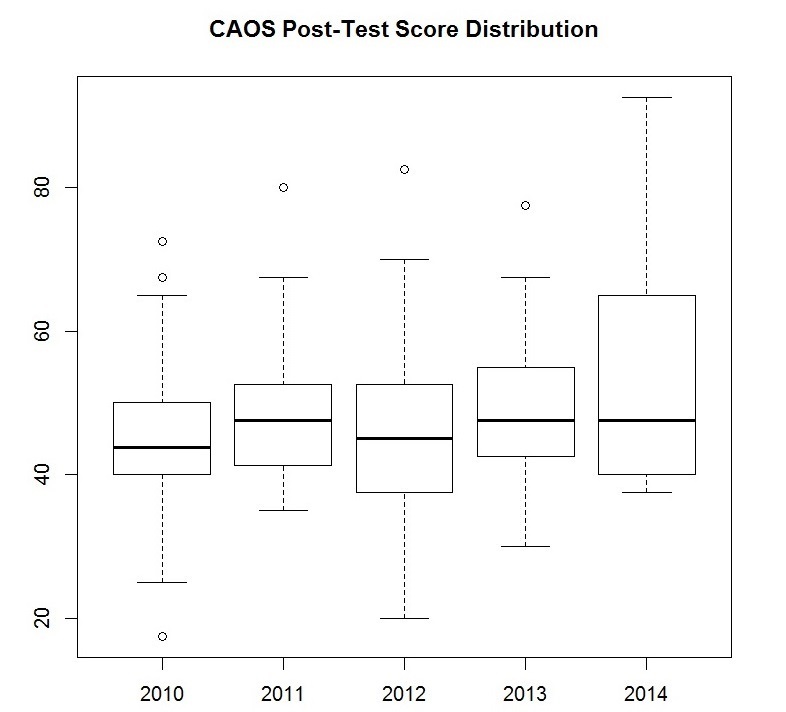 CAOS post-tests administered at the end of the course show that although the median score was similar to previous semesters, the distribution itself is no longer symmetric but is strongly skewed towards higher scores. I will collect another semester of data before publishing my story. Malone, C. J., Gabrosek, J. Curtiss, P. & Race, M. (2010). Resequencing topics in an introductory applied statistics course. The American Statistician, 64(1), p. 52-58. HON 300/ISAT 680 (Quality and Process Improvement in Action) – 3 credits, offered Spring 2012 and Spring 2013. I developed a new course with Rebecca Simmons in the College of Business, co-listed as an honors seminar and an MS ISAT offering in Spring 2012 and Spring 2013. The course aims to prepare students to analyze complex problems in integrated business, technology and engineering environments to generate tangible benefits, such as: saving time and money, improving product quality, improving productivity and efficiency, and improving the effectiveness of work processes. Students will learn about variation in systems and processes, improvement cycles, quality tools, and problem solving techniques by planning and executing basic quality improvement projects. This course goes beyond the philosophy and foundational concepts about quality covered in other business and engineering classes, and introduce students to practical strategies for defining and executing quality and process improvement projects in their community. Students learn about basic quality tools, lean thinking, and the DMAIC (Define-Measure-Analyze-Improve-Control) methodology from Six Sigma, and use them to deliver tangible value for a local business or nonprofit agency, coordinated through the JMU Center for Service Learning (CSL). GSCI 104 (Severe Weather on Earth and in Space) – 1 credit, initially offered May 2013. Developed new online course to be initially offered in May and June 2013. Covers basic concepts, data collection, and social context of severe earth and space weather, focusing on solar flares, Coronal Mass Ejections (CMEs), tornadoes, hail, high winds, and hurricanes. Bootstrapping. Keeping course materials current, and integrating new topics to keep up with the pace of industry (particularly in computing) is challenging. To mitigate this problem, I started offering course credit to students for creating new labs and new tutorials (or significantly improving old ones) relevant to the subject matter of the course. In spring 2013, 9 new labs were created in ISAT 341 (Simulation & Modeling), integrating two new simulation software packages and a new programming language (Java) into the available material for this course. In addition, the students enjoyed preparing materials for future ISAT students. Monte Carlo Methods & Numerical Weather Prediction in ISAT 341 (Simulation & Modeling). Machine Learning, Text Analysis, & Advanced Neural Networks in ISAT 344 (Intelligent Systems). Variety of Teaching Methods: Each academic year I engage in a variety of teaching methods. For example, in 2012-2013, I taught two online courses (GSCI 161/162), one graduate seminar (ISAT 655), one combined graduate/undergraduate honors course (HON 300/ISAT 680) leveraging team-based learning and service learning, one blended course (GISAT 251), three sections of a lecture/lab course (ISAT 341 and 344), and one discussion group (ISAT 131).